The Tyranny of Choice - It's just too much! 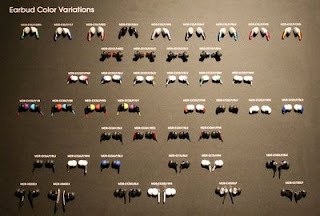 This photo from Gizmodo's Matt Buchanan sums up, in his words, "the problem with Sony." Sounds about right to me - having to select from such a large array becomes a daunting proposition, and turns the consumer off entirely. It's definitely a balance, though - too little choice and the consumer feels constrained, too much and he feels intimidated. As is often the case, Apple sets a good example - within each product category, there are only two or three variations from which to choose. Just about right! 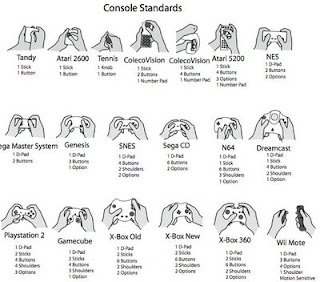 -Does this show how far we've come, or how controls have pretty much stayed the same? -What the hell was ColecoVision thinking?? Computers are just better than people at basic math. 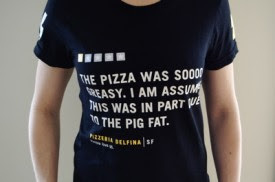 So they should also be better at the complex field of Pizza Mathematics, with its variables of toppings, slices, dietary restrictions, diameters, areas, and deliciousness. 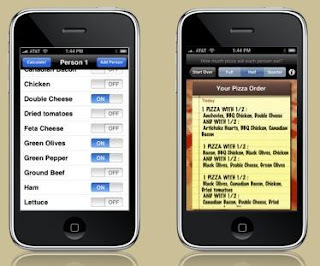 Sure enough, along comes the Pizza Calculator, an iPhone app to take care of the hard part of ordering pizza for any number of people with different tastes. It looks pretty easy - just enter which toppings each person likes and how many slices each person wants, and viola, the numbers are crunched into Your Pizza Order! Especially since pizza orders are often complicated by extreme laziness and/or altered states of mind, this could be a real lifesaver. Oh, the age we live in! iPhone + Barf Bag = In-Flight Entertainment! The clever cats at Hodenmumps came up with this resourceful and surprisingly useful improvised iPhone holder. 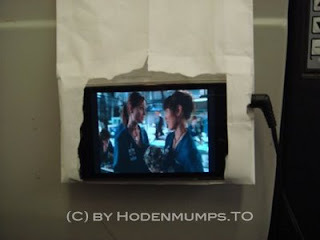 Tearing a few well-placed holes in an airsickness bag, and then tucking the bag into the folded-up table tray, the iPhone is properly positioned for long-haul movie screening. 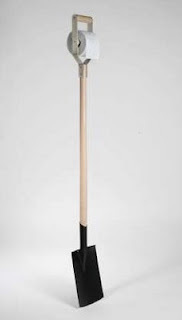 The height is even adjustable by sliding the bag further into or out of the table tray! And the whole thing can be made with your bare hands - important, since you won't be getting any cutting implements onto a plane anytime soon. It may not be pretty - really not pretty - but the darn thing works! 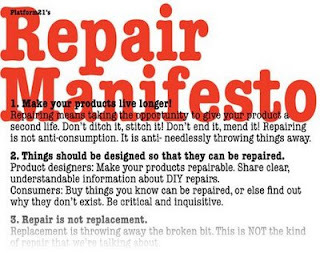 "Repair is not anti-consumption. It is anti- needlessly throwing things away. "Making repairs is good for the imagination. 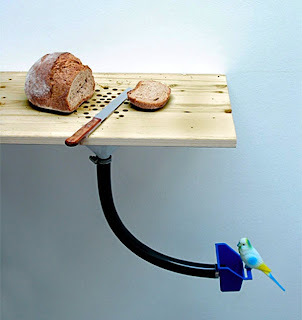 Using new techniques, tools, and materials ushers in possibility rather than dead ends." And the recommendation for designers: "Things should be designed so that they can be repaired." Ah, so true. Designers would love to package everything neatly for the consumer and keep all the magic hidden inside the "black box." But it's hubristic to think that your design is perfect or that your product will never break. Designing to allow repair can give the product a longer life with the user, and the positive experience of an easy repair may overshadow any negative experience of the damage that required it. Happier users, less waste - something to think about! -It neutralizes the power of the bad reviews. If the restaurant hides from bad reviews, or is ashamed of them, then there's reason for customers to believe there's something to be ashamed of. Putting the rants out there on display is a show of confidence! -It could provide inspiration and motivation to the staff, making them constantly aware of the possible pitfalls and bad practices to avoid. -Most importantly, I would guess, is that it shows that the place has a sense of humor. It's always good practice to put a smile on customers' faces (before they stuff those faces with pizza). Hooray! Cell phone chargers to be standardized! The GSM Association recently led an initiative to standardize cellphone power connectors, which will lead to - oh, joy! - universal phone chargers! This is a very good thing for everyone concerned, and users especially - once this initiative is acted on, any charger anywhere will work for your phone. If you're running low on juice at work, you'll no longer have to seek out a coworker with the same type of phone - anyone at all who has a charger can help. 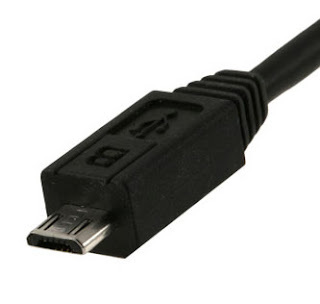 And since the standard will be based on Micro USB, you don't even need a power brick - just a cable to plug into your computer's USB port. "Power-boosting" products and car chargers will no longer have to be made in many flavors, and all chargers will be changed from high-price accessories to low-price commodities. And of course, this initiative is Green, too - keeping your charger from phone to phone to phone keeps old chargers out of landfills. Heck, phones will probably stop being shipped with chargers by default - less stuff, happier planet. In a shout-out to The Office, it's "win-win-win!" This photo (credited to Nicolas Zurcher) is from the book Designing Interactions, and it's a great statement in a single image: reduce noise, keep what you use, dump the rest. I also liked the tag on Gizmodo's post: "fixing stupidity." 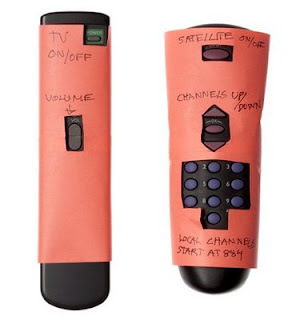 It's a pervasive epidemic, that almost every device remote wants to be a remote for every device - and the button clutter just grows and grows. The important ones get lost in a sea of trivial options and unused "features," and simple usefulness cedes to confusion and frustration. Without the extra buttons (and with the chamingly ugly paper sleeves), things become easily useful again. Designers, take note! 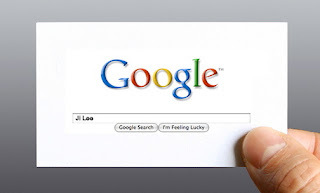 "Google Me" Business Card - If you've got it, flaunt it?